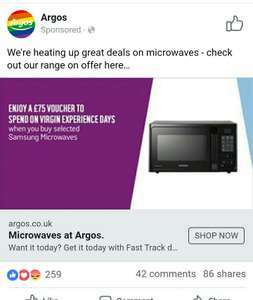 Any chance of a direct link to the Samsung microwaves on offer? Scroll down 45 deals and you can find the link. So you couldn't be bothered to find the ACTUAL deal then. Laziness, I'll vote when I see the real deal, not just a myth. I'm not saying it doesn't exist, I just can't currently see the deal. 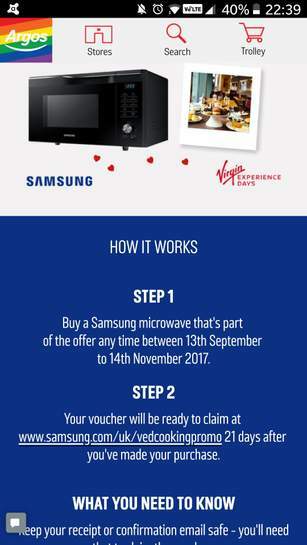 Done a little digging, and your deal, is exactly the same as mine, it's an up to £75 Virgin experience days voucher UP TO. So your op is wrong, please change. This is already posted - please remove and get some originality (I can see you posted on the original deal saying it was cold too). Step 1 travel back in time. Deal posting newbie! This is Ashley_Thomas first deal post. Help out by leaving a posting tip or just to show your appreciation for their contribution.